Well, they say if you remember the '60s, you weren't there. I remember it and I was there. But the '60s was somewhere else. It didn't happen around me. I heard about it, read about it, and even looked for it, but by the time I got where I thought it was it had moved. What I wanted was someone to stop me in the street and say "I hear you're a talented writer/musician/male model/actor/film-maker who only needs a break. Come and work for me and Twiggy, and you can live on a houseboat on the Thames and drive an E-type Jag." But it never happened, and I remained undiscovered. So it was frustrating having to study with no money, having to get very ordinary jobs a long way removed from Carnaby Street and the King's Road, and move amongst people who only drove Morris Minors. But that's what most people's life was like, I'm afraid. So you could watch episodes of the Avengers in '66 and have the same "I wish I was there" feelings as you might have if you're a twenty-year old watching them today. I once stopped somewhere outside London to help two guys whose van had broken down. They were called Pink Floyd and had had just one record low down in the charts called "Arnold Layne". I drove one of them (don't ask me which one) to the nearest service station to buy a heater hose, and then drove him back again. I attended a talk at Portsmouth Polytechnic given by the playwright Arnold Wesker, who had just come back from Cuba and was keen to sing its praises. He breezed into a tiny lecture hall in front of about thirty people in a flowing cape and gaucho hat. He looked like the man on the Sandeman Port bottle. I spent most of one Saturday morning in the I Was Lord Kitchener's Valet boutique, where the '60s was supposed to live. I didn't buy anything. I was at the Rolling Stones free concert in Hyde Park in '69 with a friend. I've never seen so many people in one place in my life. We hired a boat on the Serpentine and spent the whole day lying on our backs listening to the noise from about half a mile away. That's why my hearing is still good today. So, yes, I was there, but really I wasn't. Not much evidence on camera of the Swinging 60's - the photographer in The Bird Who Knew Too Much, the rebellious students in A Sense of History, Mrs. Peel's outfit as she leaves a party in the Girl From Auntie, but I agree that The Avengers were very much a part of the 60's. What made them so was their fresh way of using the medium of television. There had never been anything on TV remotely like them before. That's what the 60's were all about - new ways of looking at everything from art to life styles to politics - to just about everything. Terence Lodge's character in "The Wringer" (Groovy, Baby) and the photo session in "The Murder Market" (Where Steed puts his bowler on the model's head) also come to mind. [quote="Ketman"]Well, they say if you remember the '60s, you weren't there. I remember it and I was there. But the '60s was somewhere else. It didn't happen around me. I heard about it, read about it, and even looked for it, but by the time I got where I thought it was it had moved. What I wanted was someone to stop me in the street and say "I hear you're a talented writer/musician/male model/actor/film-maker who only needs a break. Come and work for me and Twiggy, and you can live on a houseboat on the Thames and drive an E-type Jag." But it never happened, and I remained undiscovered. So it was frustrating having to study with no money, having to get very ordinary jobs a long way removed from Carnaby Street and the King's Road, and move amongst people who only drove Morris Minors. But that's what most people's life was like, I'm afraid. So you could watch episodes of the Avengers in '66 and have the same "I wish I was there" feelings as you might have if you're a twenty-year old watching them today. UK bands of the era. Arnold Layne..what a wild song...Syd Barrett was out there ! Syd benefitted from the James Dean syndrome. If you die or fry your brains young enough, your reputation will only get better. I like the Floyd, but for me it's the Beatles, the Kinks and the Who from that time. I'm a Mod, really. I tried work, it didn't work out. It was too much like work. I agree - the TV shows from back then that I remember as being pretty good, such as Mission Impossible, The Fugitive, and the ones you mentioned, do not stand the test of time like The Avengers does. I used to go diving with a guy who went to the aid of a group of lads who's grotty van had broken down on the moors between Manchester and Sheffield in the early sixties - turned out they were the Rolling Stones. he said they were nice lads. The nearest I've come to famous rock stars is being nearly run over by Bauhaus' limousine. It would've been so much cooler had the Stones almost run you down. Not quite the same seeing David J or Daniel Ashe, is it? 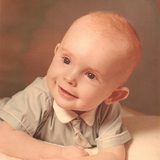 The funny thing about "If you remember the Sixties, then you weren't there" and "Don't trust anyone over 30" is that anything said by Boomers tends to be hilarious rubbish, because the irony of those statements reveals itself through Sixties nostalgia and a generation nearing "Senior Citizen" status. how true...how many times have you revisited a show or movie, from years past, only to discover how dated it has become, or hasn't held up..??? on the flip, the Avengers still holds up well for me...I'm sure many of us, feel the same way! The black-and-white shows seem better than ever to me; the Tara King series just as brilliant as before. Only the color Emma Peels seem duller than before. Watched Room Without a View the other day, which has the rare reminder of the time period when one of the prisoners asks "What year is it?" and is answered with "Nineteen Sixty-Five." Seen it today, too ! With (especially) the Peel-era Avengers, I often get the feeling that the rest of the "Swingin' '60s" is happening just off camera and that the show is a part of the whole "scene" of the time. I'm sure I'm just romanticizing the time but somehow the strains of Sgt. Pepper's and the sights of Carnaby Street are vivid in my mind, especially in the monochrome season. I always think in terms of the Beatles' films. 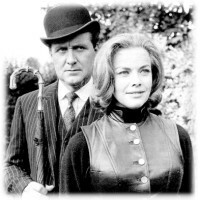 The scene that best sums up the 60s fashion/culture context is in The Murder Market when a trouserless model is in a photo shoot and Steed puts his hat on her to complete the picture. It's one of those rarities: a perfect scene and one which encapsulates that mid60s context. Oddly enough, Ketman's reply all those years ago fits in with what this thread was all about: the belief that the Sixties were raging seemingly everywhere, except where one happened to be; this was also the case with The Avengers. Did you ever dream about a place you never really recall being to before? A place that maybe only exists in your imagination? Some place far away, half remembered when you wake up. When you were there, though, you knew the language. You knew your way around. *That* was the sixties. [pause] No. It wasn't that either. It was just '66 and early '67. That's all there was."